I HAVE travelled all around the world – stayed in the dingiest of hostels and the most luxurious of five-star hotels. But I had never had a staycation, nor had I particularly wanted to stay that close to home. For me, the most exciting thing about a holiday had always been getting far away from the stress of work and your home duties. Never did I realise you can get this exact feeling, driving 20km in any direction from your house. Rumba Resort on Bulcock Beach was where my beautiful boyfriend, Lion and I spent our first ever staycation for a special occasion. Let me introduce to a little thing we invented called the monthly-versary – it is what keeps us from taking each other for granted, while leading extremely busy lives. We headed down to Caloundra for 24 hours, for our 16th monthly-versary and had the time of our life. 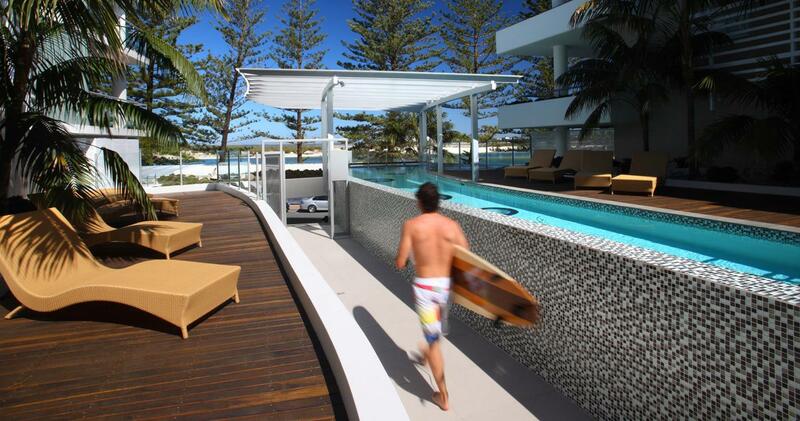 Having never spent any time in Caloundra – I didn’t really know what to expect when checking in at Rumba. I quickly realised it only takes opening up your holiday apartment door to let go of all of your stress and ever-growing to-do list. No more thinking about bills, housework, your job or what’s for dinner. Instead it was all about having an afternoon nap, a bubble bath, and drinks on the balcony overlooking the beach and having plenty of time to get ready for our 7pm reservation at the acclaimed Bulcock Beach restaurant, Tides. There was also time for a beach walk and quick dip in the pool. For us, dinner is normally whatever we can throw together in a hurry after a long day, and when we do go out for a feed, it is usually Italian or a pub. So Tides Waterfront Dining was a whole different ball game, a perfect way to enjoy an evening. The menu was extensive and there were plenty of choices , with the option to tailor your dish to cater to dietary needs. I have food allergies, and going out for dinner is usually a mission in itself, but the chefs were excellent, making sure I was satisfied. along the beachfront before retiring to our plush room and comfortable king-size bed. Despite being on vacation, we decided to wake up super early on Sunday morning and watch the sunrise. Lion and I share a love of all things photographic, so sunset and sunrise at a beautiful location regularly, is a must for us. After taking in the beautiful sight and snapping a few hundred photographs of the early morning beach-goers, birdlife and passing ships, we went for a massive brekkie at Coffee Club, which is conveniently located underneath Rumba Resort. We love our big brekkies, even though it is only sporadically that we treat ourselves to them, but we couldn’t resist – and it was a special occasion. So after bacon and eggs, an orange juice or two and a coffee – we set off to check out the Bulcock Street Markets. I have to admit, even though I probably won’t ever use half the stuff I buy from them, I love markets. While wandering around the exciting stalls, I thought about the people who had been trying to get me to take a staycation, but I hadn’t listened. Not only is it good for the local economy, but it doesn’t cost an arm and a leg, and usually you can get a local’s discount, not to mention the fact it can be organised in a flash and you don’t need to spend half your time off trying to get to your destination. After only a 24-hour holiday, I was refreshed, revived and ready to start my week. I am definitely a staycation convert.